A lot of walking today with a coudy morning and some showers. The precipitation had no effect on water clarity early on. ishing pressure in the section I fished today was minimal at best with just me,myself, and I for the most part all day. 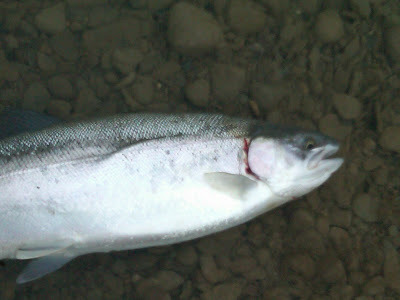 I hooked into a large female that raced down stream under a small tree and rocketed herself on the opposite bank. I gave slack line and she rolled back in the water and swam back under the tree . I brought her in and took a long time baby sitting her until she could swim away. I hope her extraordinary antics didnt do her in. 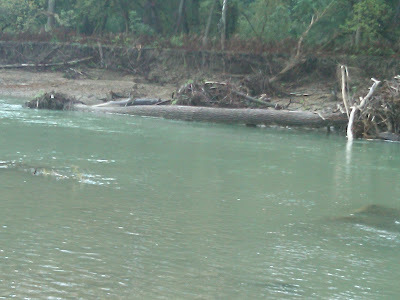 A number of fish were hooked and lost in brush and down trees. Action was good until the weather went from cloudy and occasional light showers to partly sunny with some clouds. then she turned off for a while. Lots a walking and I saw a bald eagle to boot. a nice morning with zero fishing pressure.